Matt receives a nice drum set from his parents and starts lessons with Mr. Thompson. He discovers he is talented, and brags to his friends on how good he is on drums � so much that no one wants to be around him. One day, Matt visits a music store and watches a strange-looking man, dressed like a rock star, playing the drums. The man warns Matt that if he continues to brag, his drums will shrink until he won�t be able to play any more. 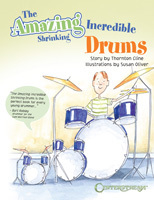 Matt discovers that it doesn�t pay to brag and learns how to keep his drums from shrinking. A songbook of 10 fun and catchy original tunes is included. Recommended for 4-8.